It’s safe to say that vintage Rolex watches are having a moment in the watch collection space with record-breaking prices at auctions and soaring values in the secondary market. As a result, even if one loves the look of a vintage tool watch, current prices are prohibitive for many. Thankfully, Tudor, Rolex’s sibling company, has stepped in to give us a stunning vintage-inspired dive watch built to modern standards. Let’s have a closer look at the new Tudor Black Bay Fifty-Eight from Baselworld 2018. This is the Tudor Black Bay Fifty-Eight S&G. 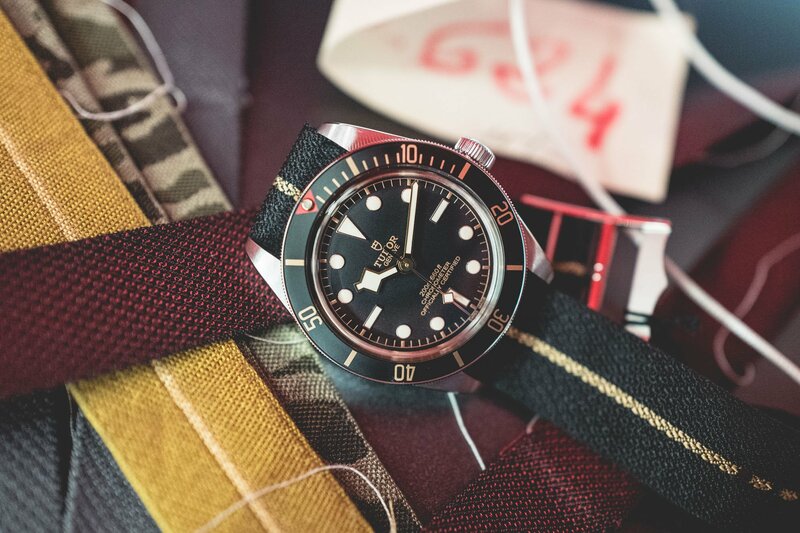 The entire Black Bay collection from Tudor—which made its debut in 2012—is in fact inspired by vintage Tudor dive watches from the 1950s and 1960s. However, prior to this year, they sported larger 41mm cases. The new Tudor Black Bay Fifty-Eight (ref. 79030N) includes a stainless steel case that is not only smaller in size at 39mm in diameter but also slimmer at just 11.9mm thick. These new pared-down proportions fit nicely into the retro style, as vintage watches are typically much smaller than today’s modern counterparts. Whether for men who favor more restrained sizes or for women who want a cool dive watch, this new size is right on so many levels. Emphasizing the vintage vibe of the Black Bay Fifty-Eight is the black domed dial fitted with gold surrounds on the luminescent hour markers, gold center hands, gold outer minute track, and gold text. 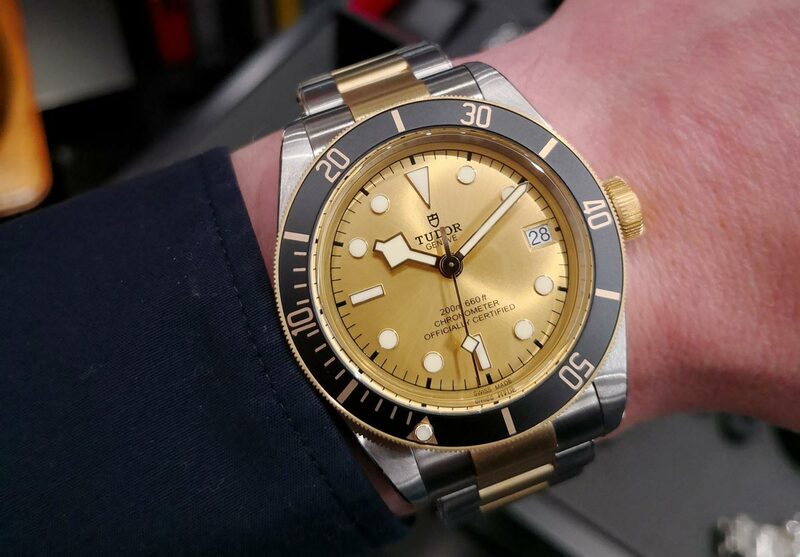 Plus, there’s also the gold detailing on the black unidirectional rotating dive bezel like the classic Submariner. Characteristic of Black Bay watches, the new Tudor Fifty-Eight also includes the snowflake style hands from the late 1960s and an oversized winding crown. Protecting the face of the watch is a domed sapphire crystal. Tudor currently offers the new Black Bay Fifty-Eight with three different strap options. There’s the riveted satin-finished steel bracelet, the brown leather strap equipped with a folding clasp, and a black fabric strap with a gold stripe running through the center. The new MT5402 is a non-date movement with an openwork rotor and variable inertia balance. It offers a very respectable 70-hour power reserve and it is, of course, COSC-certified. The Black Bay Fifty-Eight is water resistant to 200 meters (660 feet). Tudor certainly unveiled plenty of watches at Baselworld 2018 and the Black Bay Fifty-Eight is no exception. Perfect for those who appreciate a watch that has a vintage look, a smaller size, and a more accessible price point, the Tudor Black Bay Fifty-Eight will no doubt have plenty of fans clamoring to get one on the wrist. What do you think of the new Tudor Black Bay? Do you like the smaller and thinner case? Leave us your thoughts in the comments section below.